Scientists investigated bush-crickets' mating calls, which are created by rubbing one wing which has a scraper-file against the other which has a file of teeth to cause vibrations and radiate sound, and found that the density of the teeth and length of the file can alter the tone of the sounds. There are more than 7,000 known species of bush-crickets, each with its own unique mating call which range from cleaner, tonal sounds (or single frequency continuous notes like humming), to more erratic 'white noise' signals (called broadband signals). The variety of tonal sounds help the insects to evade predators as it makes them more difficult to locate as well as being more attractive to females. The Leverhulme Trust-funded study examined 40 species of bush-cricket which produced sounds across a range of frequencies up to 70kHz - up to 50kHz outside of the hearing of the human ear. 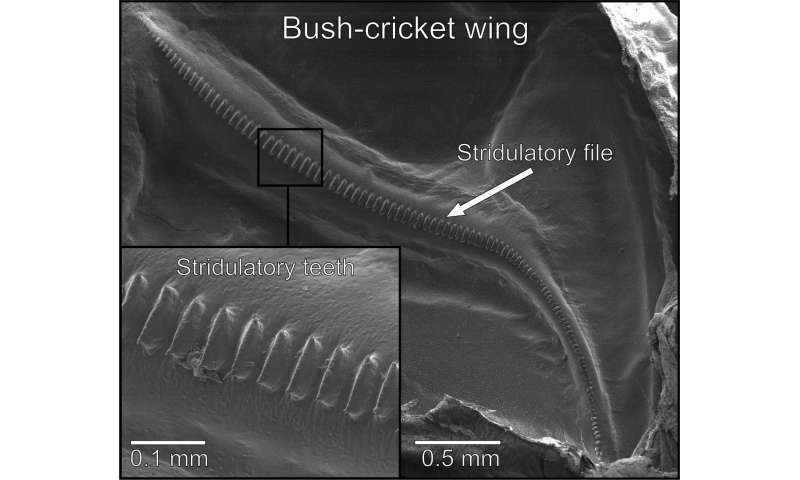 The mating calls of the crickets were acoustically recorded and digital photographs were taken of the sound-producing wings using a scanning electron microscope. A range of measurements were then taken to establish file length, tooth width, file-bearing vein width and tooth density, among others. The results suggest that the structure of the file is evolving to modify the produced song that will best attract females. Significantly, the researcher team at the University of Lincoln, UK, established that shorter files, often associated with species of a smaller overall body size, produce more musical calls while rigid files with a higher density produced a lower tonal purity. The scientists also found that the variety in the spacing of teeth didn't create chaotic or disordered sound while file length and density did. The findings have been published in the Royal Society's journal, Biology Letters. The study was led by Benedict Chivers, a PhD student in the lab of Dr. Fernando Montealegre-Z (a Leverhulme grantee) in the School of Life Sciences at the University of Lincoln. He said: "Previous studies have shown that the frequency with which the tooth-scraper interactions occur dictates both frequency and tonality of the call, but little was known about the structural causes of either noisy or tonal calls. "Because the sound generation structures of bush-crickets are not isolated units, changes in one component may lead to changes in others, so understanding which of these components are important for producing the tonality or the frequency of the call is challenging. "Our study has shown that density and file length are not only integral to the production of both broadband or tonal mating calls in bush-crickets but also help us to predict the tonality of mating calls across bush-crickets species. "Producing the correct song is of great importance to ensure that the male will mate, and our results suggest that evolution is acting on the structure of the file, as just one part of the sound generation system, to modify the produced song that will best attract females."